ENL is strongly committed to the idea that underlies all efficiency measures: performing an economic task in the best, least wasteful manner possible. The framework therefore defines several types of efficiency, including the two described here, which relate to consumption and distribution. The term "efficiency" is used in several distinct ways in standard thought. It can refer to technological efficiency, which is the output quantity that can be produced with a given set of inputs. It can also mean economic efficiency, which is the value — in the standard, subjective sense — that can be produced with a given set of inputs. Finally, the term can refer to allocative efficiency, which is synonymous with Pareto optimality. This refers to the allocation of inputs that maximizes a society's desired outputs. These efficiency definitions are avoided in ENL because they ignore health, and thus conflict with the framework’s goal of sustainable well-being. Instead, the following efficiency measurements are used. In this and all other efficiency measures defined in ENL, the quantities referred to are total quantities. In the formula above, therefore, the reference is to the areas under the effectual value and potential value curves, not to the marginal values depicted by the curves themselves. Consumption efficiency takes into account all the factors that can decrease effectual value: satiation, maldistribution, and the various output losses. If these effects are entirely absent and the transformation from potential to effectual value is fully achieved, the numerator and denominator will be equal and consumption efficiency will be 100%. Conversely, if no effectual value at all results, consumption efficiency will be 0%. An output’s distribution is perfect if each unit goes to the individual who is most capable of converting its potential value into effectual value. If this occurs, the numerator and denominator will be equal and distribution efficiency will be 100%. Distribution efficiency is used to measure the degree of a final output’s maldistribution. The following figure illustrates the efficiency measures. 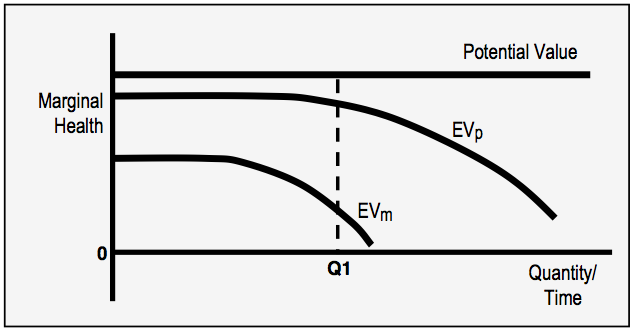 Consumption efficiency at output quantity Q1 is the area under the EVm curve divided by the area under the potential value curve. Distribution efficiency is the area under the EVm curve divided by the area under EVp curve. In this figure the output is assumed to incur some degree of maldistribution, and the area under the EVm curve is therefore the total effectual value actually achieved in consumption. The area under the potential value line, up to quantity Q1, is the output’s total potential value. The ratio of these two areas, as a percentage, is the output’s consumption efficiency. The area under the EVp curve, up to quantity Q1, is the maximum effectual value that could have been achieved through perfect distribution — that is, the decline in effectual value is due entirely to satiation. The ratio of the area under the EVm curve and this second area, as a percentage, is therefore the output’s distribution efficiency. Because consumption efficiency is a percentage, all such efficiencies are commensurable, which means that they can be quantitatively compared. This is also true for distribution efficiency, but it is not the case for all of ENL’s efficiency measures. In addition to consumption and distribution efficiency, ENL defines three other efficiency measures: for allocation, production, and the economy as a whole. These are addresses in ENL's treatment of production and cost. The framework also defines ecological efficiency as part of its treatment of environmental limits. ENL’s efficiency measures, with the sole exception of ecological efficiency, are referred to as human efficiencies because they relate directly to human health. The key feature of such a measure is that its increase is always associated with a health increase. This is not true for ecological efficiency, which is a technical measure that ignores health in its definition. If this measure rises, health may or may not improve, depending on concrete circumstances. The human efficiencies are included in ENL for two reasons. First, they permit the analyst to quantify the health contributions of an identifiable set of economic operations, which may help in isolating a problem area. For example, if the health gains from an output are unexpectedly low, it would help greatly to know that its allocation efficiency is 90%, its production efficiency is 80%, and its distribution efficiency is 20%. Clearly, the key problem here is distribution, not allocation or production. The second reason for these measures is to counter the ideological impact of standard concepts. This is particularly true for allocative efficiency (Pareto optimality), which forbids redistribution among individuals even if this would increase a society's aggregate well-being. Such destructive notions cannot be permitted to skew analytical thought, and ENL thus provides constructive alternatives. 1. The introduction of efficiency measures with respect to labor and wastes would unduly complicate ENL at this stage, and would provide little analytical benefit. However, these concepts could easily be defined, and might be considered for inclusion at a future stage of the framework’s development.